Pictured, Seattle man, David Lee Morris who was charged with the stabbing murder of Gabrielle Maria Garcia. Screen shot. David Lee Morris murders his estranged girlfriend, Gabrielle Maria Garcia at Seattle’s Amory Center weeks after she got a domestic violence order of protection. A boyfriend has been charged with murder after allegedly stabbing his estranged girlfriend to death at Seattle’s Amory Center in broad daylight, last Friday afternoon. David Lee Morris, 29, was arrested after allegedly murdering Gabrielle Maria Garcia, 28, in a busy Seattle food court in front of dazed onlookers, including the estranged couple’s five year old’s autistic son who had been out with his parents. 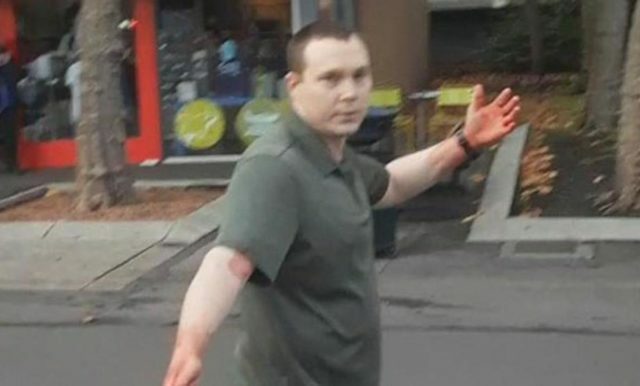 The assailant’s arrest followed a citizen with a concealed-carry permit training his gun on Morris as the boyfriend steadily walked towards the man, with his knife still in his hand, imploring Scott Brown– to ‘finish him off’. Moments later police arrived, tasering Morris – grateful that the armed citizen had contained a scene that could have potentially have involved further tragedy. The unfolding scene has since gone viral after passerby, Frankie Dean captured the armed citizen training his gun on the boyfriend as he was filmed walking steadily towards Brown with his bloody knife in hand. Screamed Brown at one point as Morris continued to refuse to put his weapon down, ‘Jesus Chris put his life on the line for you man, it ain’t worth it’. Brown said that Morris ‘kept trying to convince me to shoot him’, even telling him to ‘make the shot count’ and confessing he had just ‘killed the only person I ever loved’. Seattle police finally arrive on the scene and scream at Morris to get on the ground. He falls to his knees and puts his hands in the air but suddenly decides to stand up. ‘He wants to die!’ one female bystander screams as Morris refuses to get back down on the ground. The police then Taser him and he screams out in pain, before falling to the ground. Morris is currently being held at King County Jail on $2million bail. David Lee Morris Seattle father: I thought killing my son’s mother would improve his life. Morris confessed to police that he murdered Garcia and told them he thought killing his girlfriend would improve their son’s life, according to the Seattle Times. He told police he first thought of killing Garcia in April or May but hoped to ‘rehabilitate’ their relationship. Garcia obtained a temporary domestic violence protection order against Morris on October 9. It was reissued later that month. She had already begun court proceedings for a parenting and child support plan in March, which was finalized by the court on October 17. But the estranged couple met on Friday to take their son to the Pacific Science Center. Morris told police he was ‘trying to engage her in conversation about their relationship problems’ but she continued to avoid the topic. He pulled out his knife in preparation of killing her in the Science Center, but decided he wanted to talk to her more while they bought pizza for their son. Morris told investigators then bringing up their relationship again- as the estranged couple sat at MOD Pizza, only for Garcia to say she was going to the bathroom. According to an arrest affidavit, Morris thought Garcia was going to the bathroom to call her attorney so he ‘decided it was time to kill her’. Morris said he plunged the knife in Garcia’s throat several times because ‘he knew the first penetration did not hit the jugular properly’, according to the Seattle Post-Intelligencer. Garcia was rushed to a local hospital, where she died a few hours later from her injuries. During investigations, Morris said he thought it would be better for their son if he lived with other family members, which he believed would happen if Garcia was dead and he was in jail. Following the weekend tragedy, the couple’s son was taken into Child Protective Services who are now seeking his ‘new’ placement. Morris has since been charged with first degree murder with aggravating circumstances of domestic violence. He is scheduled to be arraigned on Nov. 21.